Three concept designs, created in collaboration with Ian Callum, were presented to guests, showing Barr Gazetas’ vision for the ‘charging plazas of the future’. He said: “I am incredibly proud of what we have created in the Jaguar I-PACE and the reception it has received since its launch. It is a truly revolutionary vehicle with one of the most advanced zero-emissions powertrains ever fitted to a production car. The I-PACE is instantly recognisable as a Jaguar, with the beautiful design and dynamic capability inherent in our vehicles. 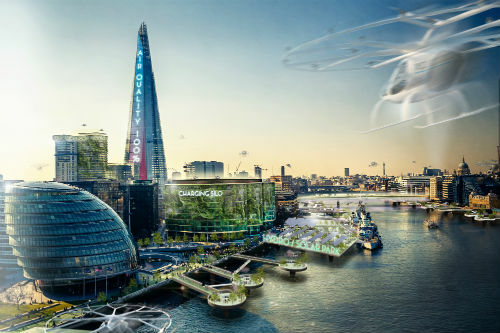 Electric City – fast-approaching reality of completely emission free major cities… In this image, London is a cleaner, healthier city where repurposed, new infrastructure, connected to electric vehicles, has allowed a proliferation of vegetation and green space. Cities across the UK are electrically self-sufficient harnessing solar and tidal power to power the increased number of electric vehicles, both land-based and airborne. Electric future – opportunity for wholesale change, up and down the country…Reimagining post-industrial wastelands. Here we have taken Liverpool’s Stanley Dock as an example. Built in 1901 it was once the largest building in the world, but fell into disrepair in the 1980s, symbolising lost industry and economic difficulty. In this image it has been reimagined as a community interchange, helping to rejuvenate the city through the creation of new community facilities and industries based on green energy on redundant sites country wide. 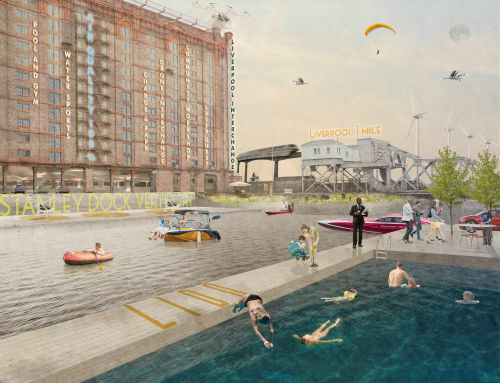 Linked to the future of transport and car-free city centres, redundant brownfield sites like Stanley Dock can offer the multi-modal ‘last mile’ connection to cities, whilst rejuvenating the communities they are situated in.